The Shorewood School District mailed out a survey to Shorewood residents in Fall 2018 to collect feedback on the District’s Facilities Planning initiative. To collect this feedback, the District worked with School Perceptions LLC, an independent firm with expertise in conducting community surveys. All survey feedback was anonymous and confidential, and submitted directly to School Perceptions. 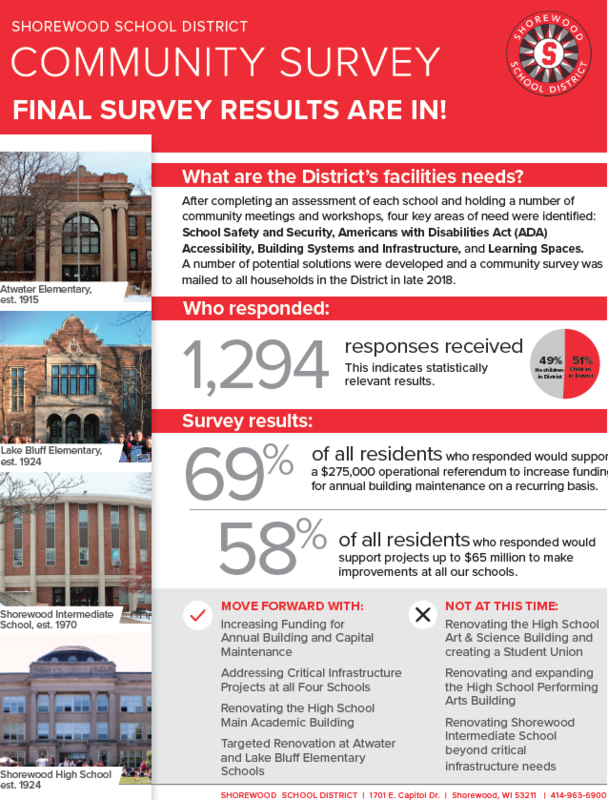 The final results from the District’s Facilities Community Survey were announced at the January 8, 2019 Shorewood School Board meeting and reviewed by the Board. The survey data included the responses from all Shorewood residents who completed the survey between October and December 2018. In total, 1,294 responses were received, which indicates statistically relevant results (16% participation rate). 69% of all residents who responded would support a $275,000 operational referendum to increase funding for annual building maintenance on a recurring basis. 58% of all residents who responded would support projects up to $65 million to make improvements to the District’s four schools. · Increasing funding for annual building and capital maintenance. · Addressing critical infrastructure projects at all four schools. · Renovating the high school main academic building. · Targeted renovations at Atwater and Lake Bluff Elementary Schools.